For other uses, see Max Unger (disambiguation). Maxwell McCandless "Max" Unger (born April 14, 1986) is an American football center for the New Orleans Saints of the National Football League (NFL). He played college football at Oregon, and was drafted by the Seattle Seahawks in the second round of the 2009 NFL Draft. 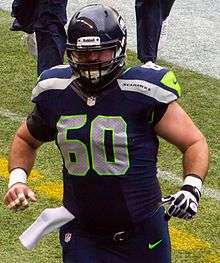 Unger was the starting center for the Seahawks in Super Bowl XLVIII. Unger was born in Kailua-Kona, Hawaii. He attended Hawaii Preparatory Academy in Kamuela, Hawaii, where he was a 2002 second-team all-state offensive honoree. Regarded as a three-star recruit by Rivals.com, Unger was listed as the No. 45 offensive guard. He chose Oregon over Oregon State. Unger attended the University of Oregon, where he played for the Oregon Ducks football team from 2005 to 2008. While playing for the Ducks, Unger was twice named as a first-team All-Pac-10 selection, and also receiving honorable mention and second-team All-Pac-10 honors. He was a first-team All-American in 2008. Unger started on the offensive line all four years for the Ducks. Projected to be second round selection, Unger was listed as the No. 1 offensive guard available in the 2009 NFL Draft. He was described as "not a great prospect," yet having "starting potential on the NFL level for years to come." Unger was drafted by the Seahawks in the second round. He was the highest selected Oregon Ducks offensive lineman since Tom Drougas in 1972. Unger with the Seahawks in 2013. Unger signed a 4-year contract worth over $3 million on July 29, 2009. After a pre-season effort in which Head Coach Jim Mora said "We believe he is ready to start and be a productive player in this league immediately," Unger was named starting right guard over Mansfield Wrotto. In 2012, Unger signed a four-year extension worth a maximum of $24 million making him one of the top 5 paid centers in the NFL. He was one of only three members to remain on the Seahawks from before John Schneider's arrival in Seattle in January 2010, along with Brandon Mebane and Jon Ryan. Unger won his first Super Bowl title with the Seattle Seahawks in Super Bowl XLVIII, beating the Denver Broncos by a score of 43–8. In 2013, he also made his second Pro Bowl team. In 2014, the Seahawks finished the season with a 12–4 record and made it back to the Super Bowl. The Seahawks failed to repeat as Super Bowl champions after they lost 28–24 to the New England Patriots in Super Bowl XLIX. On March 10, 2015, Unger, along with the Seahawks' first round selection in the 2015 NFL Draft, were traded to the New Orleans Saints in exchange for Jimmy Graham. ↑ Bell, Gregg (September 4, 2009). "Seahawks still undecided on kicker". SeattleTimes.com. 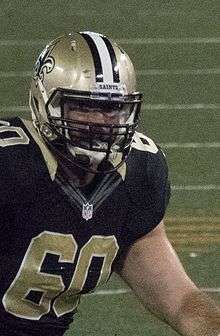 ↑ "New Orleans Saints agree to trade to acquire center Max Unger, 1st-round draft pick for Graham". NewOrleansSaints.com. March 10, 2015. Retrieved March 10, 2015.